Sensitive skin has specific cleansing needs. To look and feel its best, it needs the right clean and specific care. The cooling gel texture forms the perfect lather to gently remove excess oil and thoroughly cleanse without drying skin. The formula infused with plant extract and zinc softens skin and minimizes imperfections. Wet face and gently massage cleanser into skin and around eyes. Rinse and pat dry. Use AM and PM. Clean your sensitive skin on the go with Garnier SkinActive Clean+ Soothing Makeup Remover Cleansing Towelettes. Rated 5 out of 5 by Norma94 from I'm still waiting for this to come back! My sensitive acne-prone skin cleared right up with this magical cleanser. Please bring it back! Rated 5 out of 5 by Maria1991 from Please bring this product back! I used this before it was discontinued and it was the cleanser I never new I needed. No fragrance, no irritation, removed makeup, and it noticeably cleared my skin! Please bring this product back. I know I am not the only one who has begged! Rated 5 out of 5 by Elfinmajick from PLEASE BRING THIS BACK!!! I Looooove this cleanser. Its the only cleanser that doesn't dry out my skin or make my skin tight after cleansing. The new gentle cleanser has twice the ingredients, but its supposed To bee better? I don't think so. Please bring this back. Rated 5 out of 5 by whyme from Bring it back! I have oily, acne prone skin and this was so gentle and left my skin feeling soft. Not too drying, but also didn't leave a film like some other cleansers. For all those looking, it's still available (for now) on Amazon, which is where I'll be buying mine til it runs out. 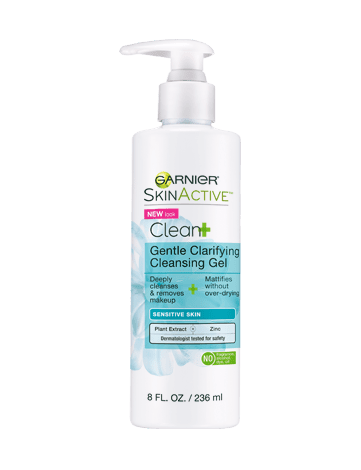 Rated 5 out of 5 by Lexmcamp from WHYYYYYYYYYYY NOT AGAIN This is the second time Garnier has discontinued a product that magically clears up my skin!!! :( Why would you discontinue this, it was the best face wash I've ever had. Both my room mate and I are very disappointed as we both really loved this product! Rated 5 out of 5 by Sarah38838494838 from PLEASE bring this back!! This is hands down the best cleanser I've ever used. I tried the sulfate free cleanser and it breaks me out so badly, I hate it. Still desperately searching for a product similar to this clean + gentle gel. Rated 5 out of 5 by Aries from Best cleanser I've tried - why discontinue!! I recently finished off my bottle of this cleanser only to find out it's been discontinued! I'm so afraid to try anything else- this cleanser did everything right! Cleared up my skin, kept it from getting to dry, evened my skin tone. Nothing's ever worked so well, I even stopped wearing makeup because my skin was so clear. Please bring it back! Rated 5 out of 5 by Taeshazy from Why?! Nooooooooooooooo!!!!!!! This was the absolute BEST face wash I've ever used! Please bring it back!